He was 6'7" and had long, long, long legs... He had legroom to spare in this car. I'm a more ordinary 6'0" and rode in his car once... Felt like you could have a basketball game inside there! In addition to the car's huge size, it had no center hump, since there was no need for one in this front-wheel drive car. I remember this car. It was two years previous, that Oldsmobile would introduce the Olds Vista-Cruiser station wagon. Oldsmobile at the time was ahead of their time concerning the design of their vehicles. Boy that's a beautiful looking car. Imagine the sun hitting it on a cloudless day? My family bought a new 1966 Olds Cutlass Supreme (gold with a black vinyl hard top -- very pretty) to replace our 1959 Ford Galaxie. 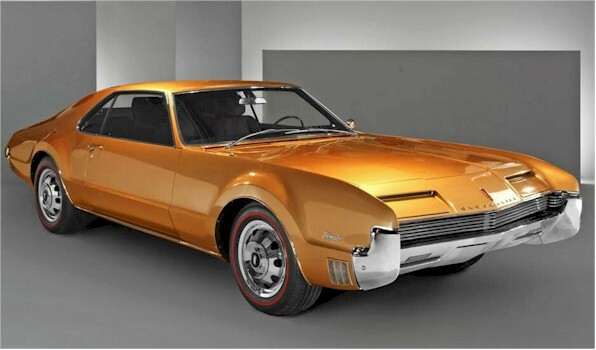 I recall drooling over the Toronado on display in the dealer's showroom.